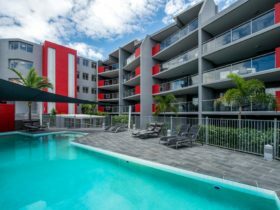 All apartments are completely self-contained so your stay in Brisbane will be a breeze. Depending on the size of your group, choose from one, two and three Bedroom Apartments, or a three or four Bedroom Suite. Featuring modern décor, fully equipped kitchens, laundry facilities, balconies, air conditioning and wi-fi, your experience will be as comfortable as possible. A great array of facilities will perfectly complement your stay. Stay in shape with a fully equipped gymnasium, a heated pool to swim laps in and a sauna to sweat it all out. 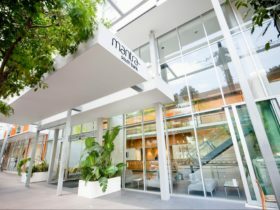 Express checkout and business services like the internet lounge and wi-fi mean you will be able to continue business as usual at Mantra on Edward. 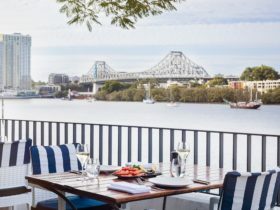 From there you’re in the perfect location to explore all that Brisbane has to offer, you’re close to the dining precinct of Eagle Street Pier and just over the bridge is South Bank. For shopping head to the Queen Street Mall, or try your luck out at the Treasury Casino. The 1 Bedroom Apartment offer spacious living quarters, generously-sized living space featuring Foxtel TV and fully equipped kitchen. There’s an iPod dock and WiFi access (fee applies), compact disc player, air-conditioning, ironing and laundry facilities. The 2 Bedroom 2 Bathroom Apartment features a full kitchen with dishwasher, microwave, and large refrigerator. Enjoy city views from your private balcony, and entertainment with Foxtel TV. The 3 Bedroom 2 Bathroom Apartment boasts city views from a private balcony, fully equipped kitchen with dishwasher and microwave, and laundry facilities. The Wickham Suite – 3 Bedroom features a rooftop terrace, three balconies, fully equipped kitchen, laundry, private terrace and city and hinterland views. The 4 Bedroom Suite boasts views over Brisbane, with a full kitchen, rooftop terrace, large living room with 55” digital TV, along with four bathrooms.